To the first question: At first I thought that the more I parallelize the better. This belief was based on Compiler Speed-up, which basically says, the more RAM you have, you should parallelize more. Although, this article, Parallelizing Compilations, showed that more parallelism is not always better. So I conducted my own experiments to verify the results. To the second question: As compiler cache I used Andrew Tridgell‘s ccache, which he wrote for Samba. For these tests I used the source code of the SLURM scheduler, see slurm.schedmd.com. This software package contains roughly 1.000 C source code and header files (~600 C plus ~300 header files), comprising ca. 550 kLOC. My machine uses an AMD CPU FX 8120 (Bulldozer), 8 cores, clocked with 3.1GHz, and 16 GB RAM. I went through the dull task of compiling the SLURM software with different settings of make, then cleaning up everything, and repeat the cycle. Below chart shows the results for varying j, once without compiler, and once with a compiler cache. Execution time is in seconds, time is “real” time as given by time command. Running more parallel make jobs than processor cores on the machine does not gain you performance. It is not bad, but it is not good either. 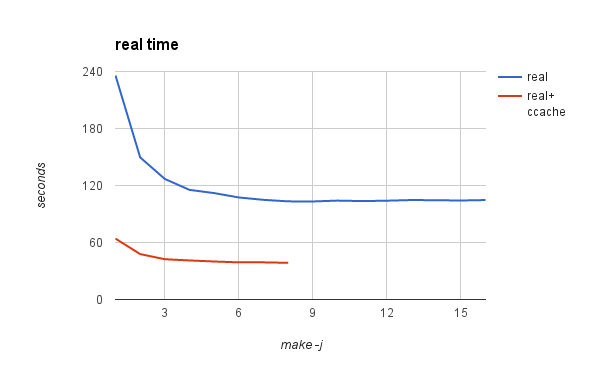 make -j without explicit number of parallel tasks is a good choice. The C compiler cache ccache speeds up your compilations up to a factor of 5, sometimes even higher. There is no good reason not to use a compiler cache. Now compiling and cleaning, going down from infinity, 16, 15, down to 1. Now the same procedure with ccache. This entry was posted in C / C++ and tagged ccache, compilation, gcc, parallel make, SLURM. Bookmark the permalink.